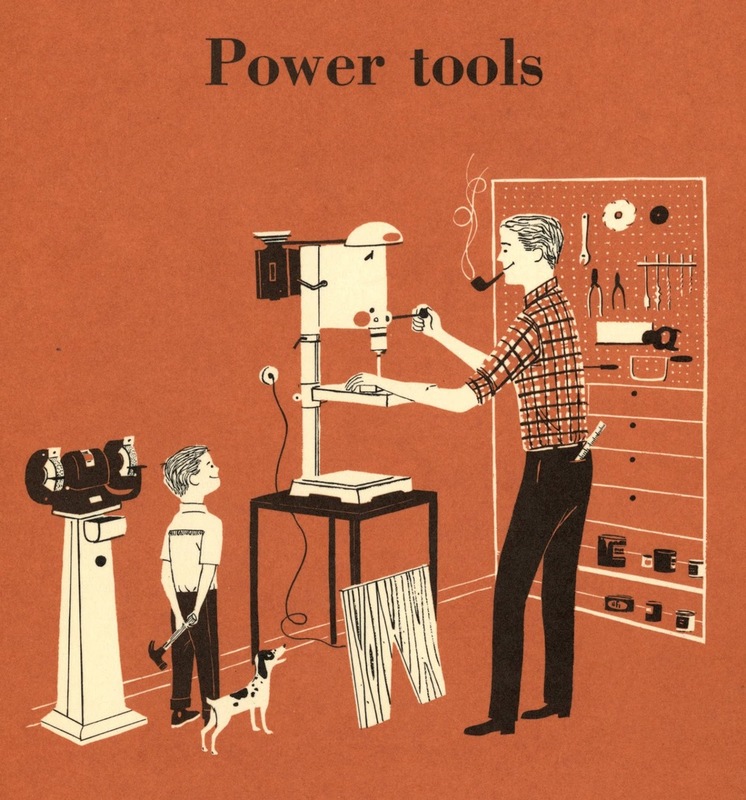 Lorraine Fox (uncredited), Power Tools, section divider illustration, Better Homes & Gardens Handyman's Book, Meredith Corporation, 1957. There can be no question that this post will establish my design-geekishness beyond a reasonable doubt. Guilty as charged. But in Graphic Tales' ongoing project to celebrate visual achievement in unlikely places, the anonymous integration of design and drawing in the project highlighted here is worthy of notice. I mentioned chiaroscuro the other day in the context of Astro Boy. The Better Homes and Gardens Handyman's Book provides another case study: section dividers which rely on differently restricted, but plenty rigorous, use of light and dark, now with a single field color (either yellow or rust-orange). Lorraine Fox (uncredited), cover illustration, Better Homes & Gardens Handyman's Book, Meredith Corporation, 1957. Lorraine Fox (uncredited), Fastening Techniques, section divider illustration, BH & G Handyman's Book, 1957. Illustration has its limitations as a word: chief among them, a narrow quality. I have tried to suggest more capacious readings of it, drawing the etymology of illumination or shedding light, but it's an uphill battle. If I had another word, I'd use it. But the problem with narrow readings isn't confined to people outside the field. Many students come to the act of illustrating with a very limited sense of what's possible, especially in restricted circumstances. The time-honored two-color problem–back in the day, born of limited printing budgets; today, in an era of four-color ubiquity, a tactical approach–qualifies as a restriction. A subject I've written about before. Exasperation with available visual means pales in comparison to asked-for depictive content: that's waaaay more limiting. Like, I mean, to the point of soul crushing. Say our young illustrator is handed an assignment to create a series of images about a canoe trip. Seriously? I have to illustrate a canoe trip? Just people standing around, with like, canoes? That is so boring! I can't possibly do anything with that subject! How to begin? The old saw about there not being any small roles–only small actors–sort of applies. If characters are supplied with decent verbs, they have a chance to do real work in the picture. Lorraine Fox (uncredited), Windows and Doors, section divider illustration, BH & G Handyman's Book, 1957. In support of that position, I turn to the uncredited illustrator for the Better Homes & Gardens Handyman's Book, a compendium of information for the do-it-yourselfer published by the Meredith Corporation in 1951. (My copy is a later printing, from 1957.) Linda Solovic picked this one up for me at an estate sale, knowing full well that I'd love these things. God bless Linda Solovic. The BH & G guide was designed for a binder (not full of women) to enable the user to pluck out relevant information without having to lug the bigger thing around. Lorraine Fox (uncredited), Walls and Floors, section divider illustration, BH & G Handyman's Book, 1957. But binders are awkward, as Mitt Romney knows. To counteract the physical challenges of the three ring contraption, the designers (also uncredited, as were the copywriters) used heavy stock dividers to break up the sections of the book. Lorraine Fox (uncredited) Building Materials, section divider illustration, BH & G Handyman's Book, 1957. The beginning of each chapter is signaled by an orange or yellow divider bearing a legend and a snappy illustration that gives the potentially dreary topic (Doors and Windows!) a friendly little kick-off. The value relationships on the orange divider pages are nicely balanced. I am particularly fond of Walls and Floors for the use of negative line to define the tiles and sweeping black line to define the glue on the floor (which is totally implied; despite the chapter head, there are no walls). The yellow dividers are less effective, due to the neighboring values of yellow (8) and white (10); you can't really read fine white lines on a yellow field. I have adjusted the levels of the yellow dividers in Photoshop to produce more contrast between yellow and white. The actual color is more lemony than this one, but a tougher read. Reference Tables, Wood Screws and Nails, section divider verso, BH & G Handyman's Book, 1957. The back side of each divider provides informational content. These things are charming, clever and inventive. Props, materials and implied spaces are used to create narrative specificity and to fill out the design. A "simple" subject is given form and wit; the reader is nourished and fortified. Note also that the approach is dominated by flat shape and an abbreviated approach to faces, informed by knowledge of how figures actually work (although the physics of how a few figures manage to stand up is open to question). Lorraine Fox (uncredited), General Index, section divider illustration, BH & G Handyman's Book, 1957.